April 2016 – Page 106 – Welcome to Wyandotte Daily! 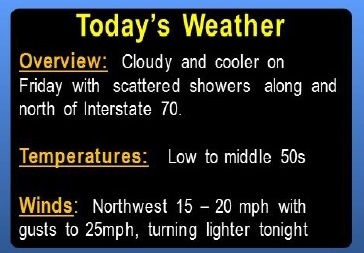 Temperatures will be cooler today, with a high of about 54, and may drop to the freezing point tonight, according to the National Weather Service. The forecast for Wyandotte County says temperatures may drop to 33 degrees tonight, which is just above freezing. The weather service warned that sensitive vegetation may need to be protected tonight. Today, there is a 20 percent chance of rain, the weather service said. A northwest wind of 11 to 16 mph may gust as high as 23 mph. Tonight, it will be mostly clear, with a low of 33, according to the weather service. A north northwest wind of 5 to 11 mph will become west southwest after midnight. 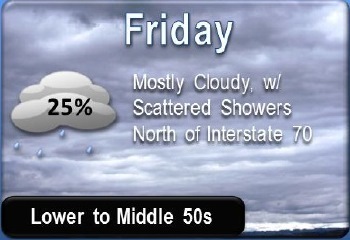 Saturday, it will be sunny with a high near 62, the weather service said. A west southwest wind of 9 to 14 mph will become northwest 15 to 20 mph in the afternoon. Winds could gust as high as 28 mph, according to the weather service. Saturday night, it will be clear with a low of 42, the weather service said. A north northwest wind of 5 to 10 mph will become light and variable in the evening. 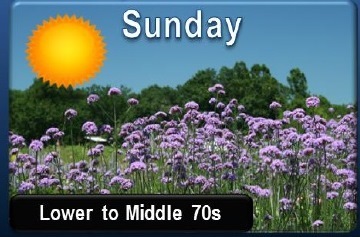 Sunday, it will be sunny with a high near 75, according to the weather service. A southwest wind of 7 to 16 mph will gust as high as 23 mph. Sunday night, it will be mostly clear with a low of 49, the weather service said. 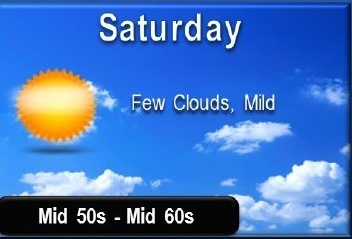 Monday, expect sunny skies and a high of 65, according to the weather service. Thunderstorms will be possible Tuesday night, the weather service said.